Gibbs: You want to make her sick? Comey: It's stupid, I know, but I figured if I helped her feel better again, she might appreciate me more. Bishop: That's not stupid at all. Comey: The thing is, I'm still working on the whole cure part. I didn't want to get her sick without that. I'm not a monster, after all. 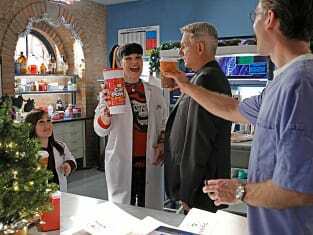 NCIS Season 11 Episode 11: "Homesick"
Palmer: I'm so not having kids. Abby: Okay Jimmy. That does it. Excuse us, director, but something has gotten into Mr. Palmer, and I would like to get it out now. Vance: Well don't let me interfere. Permalink: Well don't let me interfere. Life isn't always perfect, you know? But sometimes things would work out for the best if you just had faith.